Remember the NVIDIA Shield, the gaming handheld? How about the NVIDIA Shield, the Android gaming tablet? Soon you'll be able to replace them both with the NVIDIA Shield—the Android TV Console. Okay, maybe not replace them, but maybe outclass them: NVIDIA's first dedicated TV device is also, according to CEO Jen-Hsun Huang, the world's first 4K-capable Android set-top-box. In fact, the first thing he did at the device's GDC reveal was run through all the key features of Android TV. He seemed to like it a little more than we did. How do you control the setup? With a tiny, micro-USB rechargeable, bidirectional Bluetooth remote, of course. The remote isn't what makes the Shield TV Console special, though—NVIDIA's Tegra X1 processor chip does. The chip is a performance beast: at CES, it was shown powering a snazzy "mobile cockpit computer" for cars and running the Unreal Engine Elemental demo. In NVIDIA's Shield, it pushes 4K content from a tiny device and, according to the CEO, makes it 35 times more powerful than the Apple TV. 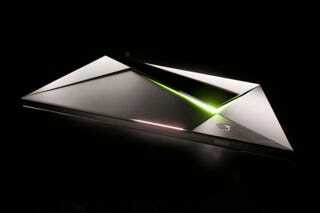 NVIDIA says the Shield is "whisper quiet" and has enough power to leapfrog last generation's home game consoles. But what can you play on it? Quite a lot. The NVIDIA Shield Hub is littered with new Android ports of top-tier console and PC games: Huang gave us a peek at the menu revealing Resident Evil 5, Tales from the Borderlands, Borderlands: the Pre-Sequel, Doom 3 BFG Edition, Metal Gear Rising: Revengance and more! But can it run Crysis, you ask? Yes, answers Jen-Hsun Huang. Yes it can. In fact, it runs Crysis 3 well enough to support online multiplayer. Hunh. The whole shebang drops this May for $199, which gets you a Shield game console with 16GB of internal storage and a GamePad outfitted with its own teeny-tiny, completely adorable mouse-pad. Not bad. But maybe a few Android ports of renowned PC games aren't enough for you—maybe you want more. NVIDIA has an answer to that: the NVIDIA Grid. We've seen this super computer-powered game streaming technology before, but today, Huang says, it's different. Grid is now officially a service you can subscribe to, not just a project. Grid will come in two tiers—a premium subscription level that streams games in 1080p at 60 frames per second, and a cheaper model limited to 30fps and 720p, and both will have access to a ton of always-available games to stream. Want more games? You can buy them piecemeal, with new AAA games available on launch day and playable within seconds of buying it. Huang showed us live on stage, scrolling through the Grid store and picking up a copy of Resident Evil Revelations 2, launching it from the stage. Yup. You can totally buy and stream games, assuming your internet connection is up to snuff. When the service launches in May, NVIDIA plans to have 50 games available, and will add another 50 within the first six months. The Grid is more than just simulated console games, though. Huang insists that it's technically the most powerful gaming platform available today. Technically, he's right—the service is backed by supercomputers, and just has a lot of raw power at its disposal. You probably won't ever use it (and you don't have direct access to it) but as far as specs go, that virtualized super computer blows the Xbox One out of the water. With that, Jen-Hsun Huang closed NVIDIA's keynote. When the company announced the Tegra X1 at CES, a new Shield device was inevitable. Here it is, prepping for a May launch alongside GRID streaming and a hell of a lot Android-ported PC games. It's probably a really good Android gaming set-top-box, but it's also not what we expected. The first two NVIDIA Shield devices were portable—a tablet and a gaming handheld that doubled as TV game consoles when plugged into HDMI. The new Shield is powerful, but in a small way it sort of feels like a step backwards. Is the upgraded processor worth the loss of portability? It's hard to say, but it's going to be fun finding out.